The defeats continue to pile up. It is nearly two months since our last win, the root cause of it is simple – a lack of goals. At the moment, the signs are that things are getting worse, whereas before we were creating chances and not taking them, even the chances are starting to elude us. Our only saving grace is that somehow we’re still some distance away from the bottom four, which provides a buffer period still for Mark Robins to work things out. However, the next few games and the ensuing January transfer window are looking set to be crucial in righting this sinking ship. Mark Robins is increasingly retreating into a defensive shell. Having taken a forward out of the side to play a 4-3-3 system – that looked a lot like a 4-5-1 – a few games ago, Robins deployed a double defensive-midfield handbrake against Shrewsbury Town on Saturday to predictable effect. The main question hovering over this upcoming team selection is whether Robins retreats further or goes for something more proactive. Although it worked last season in League Two, playing Tom Bayliss out wide does not appear to be the answer to our current attacking woes. Maybe it’s more the impact of playing two defensive-minded central midfielders, but Bayliss out wide seems to leave us with too many players behind the ball when we’re in possession, making playing effective, fast-paced, attacking football nigh-on impossible. While Bayliss’ recent form can be questioned, he undoubtedly makes us a more threatening side when deployed through the middle. With starting Bayliss centrally a must, pretty much the entirety of the rest of the side is up for debate. Lee Burge in goal, Dujon Sterling at right-back, whoever is fit in central defence, and Luke Thomas out wide are the only other automatic picks. This is the stage in a downturn in form where the team selection and line-up becomes almost impossible to predict. Could Michael Doyle return? Could there be one or two under-23 players handed unexpected debuts? All will be revealed when the teamsheet is out. The word ‘robbery’ springs to mind concerning our last league meeting with Charlton. The Addicks had conformably played us off the park for the majority of the game, somehow only notching one goal past Lee Burge – a penalty from Lyle Taylor – but there was little indication that the result was in any doubt until Amadou Bakayoko latched onto a Luke Thomas cross with ten minutes left which would have been enough to hand us a scarcely deserved point. After a glaring miss from Charlton’s Jamie Ward, the Sky Blues went one better, with Bakayoko again the beneficiary of some excellent build-up play to secure an incredible all three points. Bowyer continues to impress in his first managerial posting despite the adverse circumstances at Charlton. While the former Newcastle and Leeds midfielder has been able to sign top League One talent such as Lyle Taylor in attack and Josh Cullen in midfield, he has still had to battle against players sales and a nightmare injury list but has had the Addicks consistently playing positive, attacking football that has his side up at the right end of the table. For the third game in a row, we are up against a side likely to deploy a 4-4-2 diamond system, which is Bowyer’s preferred system. 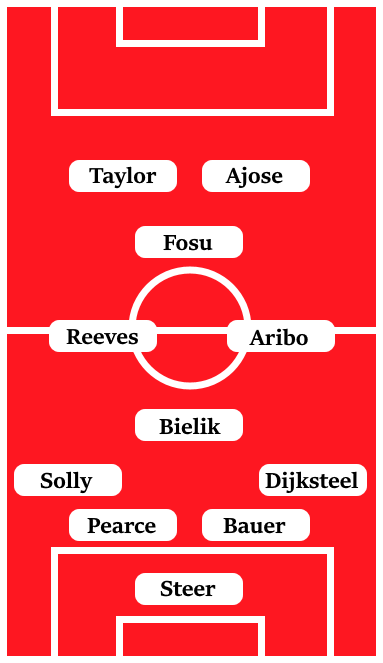 It allows Charlton to have an advantage in the centre of the park while retaining two up top, with the player at the tip of the diamond allowed freedom to float around and at times make the system look more akin to a 4-3-3. Charlton are the envy of most League One sides due to having two free-scoring strikers in Karlan Grant and Lyle Taylor up top. Not only are both goalscorers, but they are mobile, physical and technically-adept enough to link the play, making it difficult to mark both out of the game. However, with Karlan Grant currently out injured and Lyle Taylor a doubt for this game too, our task could be made easier, although Charlton can still call upon a reliable League One goalscorer in Nicky Ajose in reserve. In midfield, the two most eye-catching performers are Tariqe Fosu and Joe Aribo. Fosu is more naturally a winger but has proven to be technically-proficient enough to operate at the tip of Lee Bowyer’s diamond, with Fosu’s pace and dribbling an extra threat in the centre of the pitch. Academy product Aribo, rumoured to be off to the Bundesliga in January, is a driving box-to-box presence in the centre of the park who glides forward with the ball with great elegance and poise – although is yet another injury concern for the Addicks. Perhaps going under the radar has been the performances of Ben Reeves in central midfield, the former MK Dons man has battled back from injury to operate as Charlton’s metronome in the centre of the park, capable of mixing up the range of his passing to good effect. West Ham loanee Josh Cullen has also been an important passing presence for Charlton this year but he is another currently out through injury. While Charlton have some really high-calibre defenders to call upon, such as Jason Pearce and Patrick Bauer in central defence, injuries have left them particularly thin at the back. In particular, the absence of Lewis Page for much of the season at left-back has meant that regular right-back Chris Solly has had to fill in there while they have deployed more natural midfielders such as Krystian Bielik and Anfernee Dijksteel in Solly’s regular berth. With a number of fairly slow or uncomfortable players in defence and a possession-based approach, it does leave Charlton prone to counter-attacks. Importantly for the Addicks though over the past couple of months has been the form of Aston Villa loanee Jed Steer in goal. After a difficult start to the season, Steer’s shot-stopping efforts have meant that gaps left open by the defence haven’t been as costly as they had been earlier on in the campaign.